Mad! Its insane... - Liz Loves Books.Com. This book was insane for all the right reasons – I banged through it, once you meet Alvie Knightly you won’t want to turn your back on her, no way! Anyway, Alvie has a twin. She hates her twin. Alvie is also a bit crap at life but kind of takes it all in her stride. Off she goes to visit her sister in Italy, her sister with the gorgeous husband, tons of cash and beautiful home, a baby and the life Alvie feels she should be living. 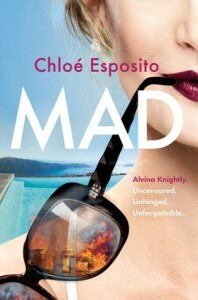 When circumstances turn slightly, well, mad, Alvie seizes her chance to step into those high high heels. This novel cracks along with frenetic, addictive style, beautifully descriptive in hot and heavy fashion, the author sets the scene, pops Alvie into it and off we go on a purely brilliant ride. Alvie has no filtered thoughts, finds she has a violent streak, observes life with a wittily intelligent outlook and manages to get into a whole load of trouble, using only her intuitive impulses to keep herself out of the danger zone. It is highly entertaining, first page to last, also quite bloody, gorgeously racy and beautifully provocative. I loved it. So glad this is a trilogy. Mad, Bad and Dangerous to know. I’m in it all the way. Bring on book 2. Alvina Knightly: Uncensored. Unhinged. Unforgettable. Yep – you got that right.